He's a rescue, a mutt. Maybe there's a little golden retriever in him, although he's not exactly pretty. He's had a run-in with coyotes and he's missing an eye. 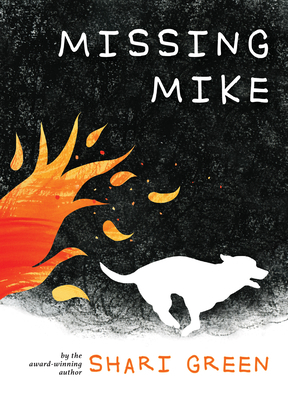 But Mike is eleven-year-old Cara Donovan's dog, and they love each other absolutely. Usually her pet follows Cara everywhere, but on the day the family first smells smoke in the air, Mike becomes anxious. Pine Grove is in the path of a wildfire, and the family is ordered to evacuate. In the ensuing chaos, Mike runs off. And then the unthinkable happens; there is no time to search for Mike. They are forced to leave him behind. Shocked and devastated, Cara watches helplessly as the family drives through a nightmare, with burning debris falling from the sky and wild animals fleeing for their lives. Once in the city far from the burn zone, the Donovans are housed with a volunteer host family. Jewel, the hosts' daughter, is nice, but Cara can only think about what she may have lost. What will happen if nothing is left? But as she reflects on what "home" means to her, Cara knows only one thing. She is not going to lose Mike. She will do what it takes to find him, even if it means going back to Pine Grove on her own. With her signature style combining simplicity and lyricism, the author of Root Beer Candy and Other Miracles and Macy McMillan and the Rainbow Goddess tells an uplifting story of love and loss. And she shows how one girl's stressful journey eventually leads her to an unexpected place, and a new definition of home.